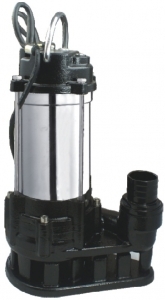 Features : Stainless steel (SUS304) pump casing with cast iron base. Genuine Copper coil. Non-Clog type impeller for solid particle handling. Equipped with mechanical seal and oil seal. Overload protection in motor. Come with 5 – 9 meter plug-in cable. Application : Suitable for waste or clean water with sediment contained (solid passage size: 30mm), Para rubber contained water, sea water, mud drainage for agriculture, water drainage in construction site.